I first picked up Blood Red Road last year (shortly after it was first published), got about 20 pages in and thought it wasn’t for me. The shortage of punctuation, the slightly jarring dialect in which the book is written and the laconic first person narrative sent me running back into the comforting and familiar arms of Miss. Austen (“There was no speech marks Jane – can you imagine!”). I was, in short, a literary prude! Since then I have navigated my way through Wolf Hall (bereft of punctuation-directions and clarity of pronouns – “which ‘he’ are we talking about now Hilary?”), botched my way through Mr. Welsh’s Filth (...yikes!) and clung to the plait of the plain-spoken Katniss (nobody seems to have coat-tails these days) throughout her exhilarating Hunger Games adventures. 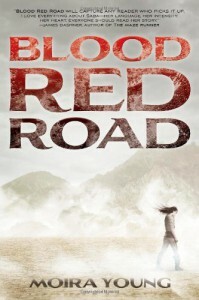 Blood Red Road is well-paced and exciting. There is a mixed-bag of great characters. The post-apocalyptic world is reminiscent of Mad-Max’s dystopic Australia but several generations down the line and minus the 80’s feel. It is a volatile and capricious world imbued with the tragedies to which it has born witness and so regularly alluded or referred to that it is almost a character in itself – I haven’t decided whether it is a goody or a baddy yet but it has certainly caused more than its fair share of problems. The female protagonist does not seem unrealistic for an 18 year old girl who has spent her whole life in a weather beaten, sand-filled nowhere with only her semi-detached father, twin brother and much younger sister for company and whose primary concerns have been lack of food, lack of water ... lack of everything. Ordinarily, one of my least favourite categories of female protagonist in YA literature is the ‘Contrived, Guileless, Tomboy’; by this I mean the girl who, inexplicably, has no idea that she is well above average in the looks department, doesn’t have even the slightest hint of a superficial concern, cannot fathom what is going on when the incredibly handsome, soon-to-be love interest favours her above all others and so on. She crops up all over the place in literature but I am yet to meet a late-teen that fits this category in real life. BRR’s protagonist, Saba, fits very neatly into this description, but the difference is, that given her upbringing it does not, for once, feel contrived and it is not used to define her character or represent her strength. 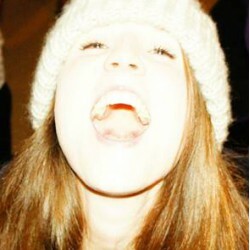 She is also more relatable than any of the wet’n’wimpy, strawberry-fondant-filled, Bella Swan clones that YA literature has been churning out of late (I enjoyed the Twilight series – but, when it comes to literature once is enough for me. If I want to read it again I’ll, you know, read it again). Lastly, the plot-points that could have so easily been clichéd and laboured avoid the ‘been there, done that, bought the t-shirt’ fantasy trap through the fresh writing style – that’s right – I ended up really enjoying the dialect, the sparse punctuation and the simple but very effective voice of Moira Young. She took a bunch of ingredients that I don’t normally like, added a bit of Moira-magic, and made something delicious! Try it, you might love it.